When Baby Boomers moved through adolescence 50 years ago, they watched their parents and grandparents age and nursing homes fill with people suffering from arthritic conditions. 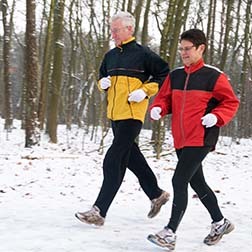 Now as Boomers hit their 60s and 70s and their own joints ache and body parts wear thin, medical advancements are allowing them to stay active and continue a high quality of life. Boomers account for nearly 40 percent of all total knee or total hip replacements in recent years due to improvements in materials, surgical technique and pain management. While they obviously seek pain relief, their biggest motivation is to get back to biking, golfing and their aerobics class. In the mid-1970s, knee and hip replacements were in their infancy. The risks were high, and complications were common. It involved a two to three-week hospital stay and patients were confined to bed for at least the first week. Having made strides over the years with pain management and pre-operative education, joint replacement surgeries are on the rise. In fact, total hip replacements are expected to increase 19 percent over the next five years and a whopping 74 percent in 10 years while knee replacements are even higher at 28 percent and 89 percent, respectively, according to national forecasts. Locally, Raumi Kudrna, CHI St. Alexius Health Total Joint Program director says knee and hip replacement surgeries have increased 20 percent in the last four years. “People are more active, so there is more wear and tear, which means there’s a greater need,” Kudrna said. “And because we’ve become so efficient and people can have the procedure and rebound so quickly it is a much more viable option.” Most patients at CHI St. Alexius only stay in the hospital about six hours beyond surgery, with 23 percent of all total knee/hip replacements discharged the same day. More than 94 percent of patients report satisfactory pain management following the procedure. Dr. Bopp has seen a lot of improvements over the last decade with joint replacement surgeries, namely because it has transitioned to be a team effort between the hospital staff, the surgical team, the post-op team, and especially the pre-op education team. Johnson leads the education aspect for patients, providing classes and an online program that allows medical staff and the patient to check in with each other so surgery and post-operative expectations are clear, particularly in regard to pain management. Dr. Bopp admits that some of the more aggressive Boomers have unrealistic expectations when they walk into the office, saying some expect to be pain free and walking with no limp the following day. For Bopp, part of being a physician is being compassionate in an effort to help people, but unfortunately, trying to meet unrealistic expectations turned into a slippery slope. But one demand the medical community is trying to accommodate is more availability for surgery. Dr. Bopp’s volume of patients, combined with the efficiencies of today’s joint replacements, means what he used to handle in a month is now being done in the course of a week.